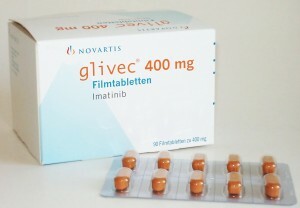 Shocking new evidence has come to light of massive profiteering from cancer drugs, with one cancer drug (Glivec, also known as Gleevec in the US) being sold for up to $120,000 (£83,000) for a year’s supply for one patient even though it costs only $143 (£99) to make. In 2015 alone, the drug generated sales revenue for its owner Novartis of $4.7bn and total sales revenues since its launch in 2001 are expected to reach $50bn by the end of this year – well in excess of the drug company’s cost to research and develop the drug, which is estimated at between $0.1bn and $0.8bn. Research undertaken by Dr Andrew Hill, a senior research follow at Liverpool University, and published in January in the BMJ online medical journal, examined the costs of manufacturing four life-saving cancer drugs used to treat leukemia, breast, renal, liver and lung cancer: generically known as imatinib, erlotinib, lapatinib and sorafenib but sold in the UK under the brand names Glivec, Tarceva, Tyverb and Nexavar. All four drugs were nearing the end of their patent periods, so the cost of producing these drugs would now be very low, as the research and development costs would have been paid back. Dr Hill looked at the prices that these four drugs were being sold for and compared them to the costs to manufacture the drugs. The results are staggering. His analysis found that the drugs were being sold for between $75,161 and $139,138 per patient per year (£52,000 – £96,000) but that the cost of producing them was only between $85 and $2,680 per patient per year (£59 – £1,852) – a profit margin of between 5,192% and 88,400%! And to rub salt into the wounds, money we gave to Cancer Research UK was used to help pay towards the costs of developing all four of these drugs. How can this be allowed you might ask? Well, basically drug companies are given exclusivity on new drugs via patents for a period of 20 years, enabling them to set prices for new drugs without any competition. This is done so that drug companies can recover the costs of researching and developing the drug. However, as there are no regulations to ensure that drug prices reflect costs, drug companies can charge whatever prices they like until the patents expire. Often they then deploy various tactics to delay other competitors from launching their own versions of the drug, so that they can maintain their high prices for a bit longer, but eventually competitors are given permission to produce alternative versions of the drugs and prices then typically tumble by 90%. Thankfully, the patent for one of the four drugs, Gleevec, has recently expired, so the price of this drug at least is expected to fall rapidly fairly soon, as generic alternatives become available. The exorbitant prices mean that many cancer patients cannot access these life saving drugs due to their high cost, particularly in less developed countries in Africa, Asia, Central and South America, but even in the UK two of these drugs are considered too expensive to offer on the NHS – drug companies tend to price drugs for the richest nations like the US in order to maximise profits and drive up the ‘value’ of their products. Dr Hill points out that if patents for these drugs weren’t stopping other companies from producing their own versions, prices would plummet. This would then make their use feasible in developing countries and also produce significant cost savings in higher-income countries like the UK, which could of course then be used to improve treatments in other areas. He estimates that over a million people could benefit from these four life-saving drugs alone if prices could be brought down to normal competitive market levels. And many more could benefit if the same approach was applied to other similarly expensive cancer drugs. Denial of access to life-saving drugs on this scale is tantamount to genocide and it is hard to believe that governments are doing so little to tackle it. Governments have the power to effectively dissolve patents and allow drugs to be made at much lower costs (a process called compulsory licensing), so the legal mechanics already exist. It just needs the political will. So, what is the UK Government doing about it? Well, not much. 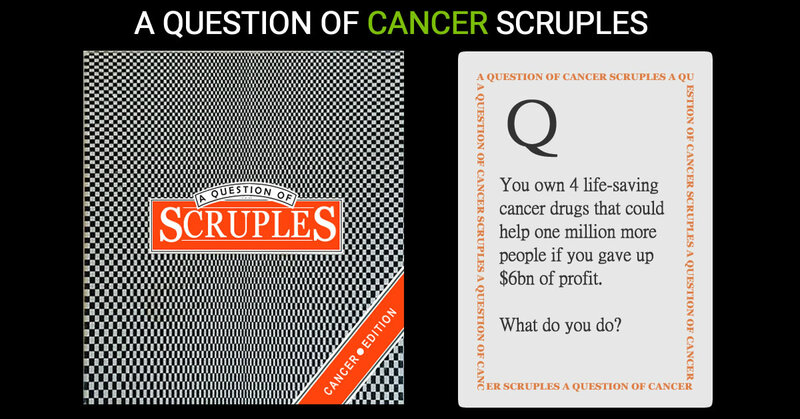 Some bright spark came up with the idea of creating a separate pot of money that the NHS could dip into if the drug companies charged more than the NHS could afford – they called it the Cancer Drug Fund. While there may have been compassionate intentions behind this gesture, it is like a red rag to a bull and will only encourage drug companies to raise their prices even more over the longer term if they know there is an extra pot of money available! There is a concept in law called “Duty of Rescue”, where individuals have a duty to come to the aid of someone in peril. In some some countries it is a legal obligation but in others, including the UK, it is just a moral obligation. However, the underlying principle is that society believes it is wrong to walk away and not help someone whose life is in danger if we are in a position to help. How then can we walk away and turn our backs on millions of cancer patients who we could help but don’t because we’ve chosen to allow levels of profit to go unchecked? Cancer patients and their families are being let down by governments too afraid to stand up to the drug companies. Profits are obviously needed to encourage investment and innovation but there are plenty of other industries that have no problem attracting investment with much lower profit margins – the pharmaceutical industry has the highest profit margins of any major industry in the world. More effort is needed to curb excesses given that the repercussion for this is loss of life. Compulsory licensing should certainly be considered as a short term measure on a case by case basis but to really protect patients’ interests in the longer term, the whole system needs fundamental reform, to curb excessive profits and ensure that prices for cancer drugs genuinely reflect costs. Please help us to change this. Please sign our petition. 5 Replies to "£99 Cancer Drug Being Sold for £83,000"
This is disgusting it’s about time something was done about this.The government are spending money on foreign countries and other things yet we have paid national insurance all our lives and they won’t help us with cancer.They should sort the pharmaceutical company’s out .Its up to everybody in this country to get up in arms. Yes, I have, you have only considered the cost of production of the drug. To get the drug licensed to be used for patients involves hundreds of studies worldwide involving many hospitals and centres to test the drug in all suitable patients and each one of those studies costs millions to conduct, run, evaluate and produce the results for the Committe of safety of medecines to grant licence to be used,That is where the most cost is involved and all this has to be met by the Pharma company.If by any chance after the 9-10 years of research there is a health issue with the trials and studies and the drug has to be pulled from the market then the Company has to stand the loss. To bring a major drug to market some 20 years ago cost over £40 million pounds.As a drug only has a 14 year patent on its license then the company needs to recuperate its money in a short time as it takes 10 years to get to market it only has 4 years left on its patent life which protects it from me to products.These are products made by any company without the costs of all the development and research and they can afford to sell cheaper as they have no earlier research costs.So please don’t gripe about the cost, it is not just production of a few tablets.How about all those people who moan about animal testing, would they volunteer to test it out even if they were paid to……Pharma companies can’t win can they.Can’t use animals and yet public are quick to complain if there is a health issue and claim compensation but won’t allow human beings to be used or animals for testing.You don’t get the same results out of a test tube.Have any of these wingers ever taken a pain killer, an antibiotic or had anaesthesia , how was that drug known to be safe to administer to humans??????????. Do not believe all the media tells you , there is a lot more to it than that……. I just wanted to make clear that the R&D costs have been considered as well as the costs of production (see links to further details on this in the first paragraph). The cost to research and develop the £99 drug (Gleevec) is estimated at less than USD$0.8bn, which includes an uplift to cover the cost of failed experiments with other drugs and the cost of financing the investment. The total sales revenue generated from it since launch will be USD$50bn by the end of 2016. The R&D cost was recovered within the first 2 years, so it has been produced at marginal cost for the last 12 years (the cost of manufacturing the pills) but still sold at up to £83,000 per patient per year. To yvonne downing , what a bunch of CANNED PR!! !